Rounding out my NAIDOC experience was an evening spent at Shopfront Theatre in Carlton, facilitated by company Dirtyfeet, featuring choreographers Thomas E S Kelly and Matt Cornell. I am selfishly writing from a position of convenience. I must confess I had a role in this dancing venture too. I am mentor to Kelly and his gang of three, making them four. Four on the floor. My involvement as experienced dance consult represented the epitome of NAIDOC (National Aboriginal/ Islander Day Of Celebration) as a participant in the inter-generational transmission of knowledge. The role of mentor is a tricky one and not for the faint hearted. How does one facilitate the establishment of an emergent voice? The mentor is the silent unsung component. As mentor one is engaged on the basis of possession of knowledge of what it takes to produce a work and the implicit ability to predict when something potentially hazardous might unfold. A mentor is not a dramaturg but is very often the person who will act as dramaturgical advocate, acting as initial audience/ artist mediator. Consequently as mentor one imparts advice as informed opinion. Although that advice may not be heeded. Inversely our hand may be nominated upon judgement. This role is a messy one, not clearly defined and certainly not formulaic. Each mentoring situation is unique. Some artists need a sounding board, some artists just require a body to witness the act of art making. In Kelly’s language I see the initial foundations in certain gestures, footwork, physical sequencing and musical phrasing. We have a shared history. Nine years of history, as teacher at NAISDA and as dancer/ performer and collaborator in my works. I feel the logic in his phrases. I could offer endings to his physical sentences and it takes all my disciplined restraint not to do so. In this work titled CO_EX_EN Kelly pays homage to a personal sacred site that has been fenced in, to ward off casual interlopers. In doing so the cultural descendants (of which he is one) have also been denied access and ultimately denied the ability to conduct expressed lineages through direct contact. He has opted for a documentary approach to this concept instead of personal narrative. Unlike my contemporary work or that of Australia’s First Nations company Bangarra Dance Theatre, or that of the ‘traditional’ forms which represent performances of unbroken Dreaming songlines post British colonialism, consisting of a series of distinct episodes or vignettes, Kelly has developed one large cohesive work. Kelly’s movement language is dynamic and percussive. Abrupt and increasingly idiosyncratic. Yet it definitely belongs to a specific family, of which Bangarra and I are also members. In watching Kelly’s work I am witnessing the remnants of a specific lineage of dance unfold. A relatively burgeoning Australian indigenous contemporary language borne from the 40 year existence of NAISDA. I say relatively burgeoning although I realise that the contemporary Australian Indigenous dance lexicon has its foundations in, and is linked to, the classical or ‘traditional’ form which has been in existence for 60,000 years. Yet in relation to other contemporary forms, it’s relatively burgeoning. The ‘remnants’ I witness belong to an intriguing and eclectic mixture of voices. Amongst the most notable is the Yolngu physicality expressed through specific stomps which have been developed from the men’s and women’s locomotor steps. From the women it is through the simultaneous contact made to the ankle by the gesturing leg as one perambulates and from the men it is the audible percussive sound made with each transference of weight whilst travelling. Then there is the Graham based Modern dance lineage. I observed this in Kelly’s piece expressed primarily through his affected Yolgnu male upper torso stance, to which Kelly often attaches gestural language and which is augmented with a slight spiral. The regular use of spiral in the torso has been instilled in him through me and in me from Graham training at the Graham School in NY but first and foremost by Paul Saliba who, hired by NAISDA founder Carole Johnson, taught at NAISDA for 20 years and embedded his passion for Graham based Modern Dance so deeply into the Aboriginal pioneering dancing bodies, its legacy continues to manifest itself in a myriad of mysterious danced genre combinations. 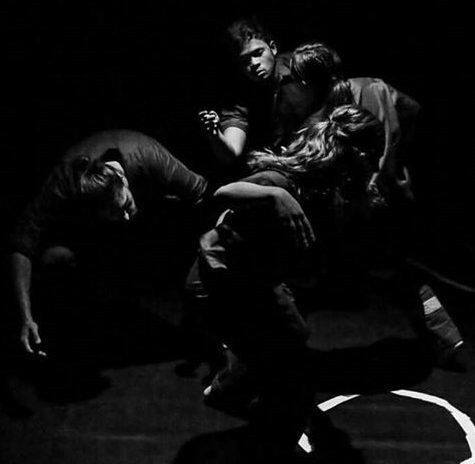 One of the most readily witnessed articulations of Graham based movement is as part of Bangarra Dance Theatre’s extensive floor work vocabularies. Paul Saliba, like many mentors, was mentors before such positions were officially designated. Certainly when Saliba worked with me on my first major choreography, Wiradjourni, it was officially to teach technique in preparation for the day’s rehearsals, although his input extended far beyond his responsibility to warm up the dancers. His presence buoyed my courage, prompting me to move outside my comfort zone both conceptually and physically. From Kelly’s work to choreographer Matt Cornell’sI Learnt My Cultural Dance From YouTube. Matt Cornel designed a heterogeneous Cipher, of sorts. A Cipher similar to the structure of the free form b-boy performances where the audience form a circular enclosure around dancers who take turns competing or ‘battling’ for dance supremacy. The difference with Matt Cornell’s group invitation gathering was that this was not a battle atmosphere, in that nobody was competing, although there was a set of rules devised and implemented, the proliferation of which was delivered via printed handbook. The most significant difference between Cornell’s version of the Cipher with those of the B-boys lay in the diversity of danced genres present, including physical theatre display in counterbalanced lifts from Joshua Thompson and expressed via the oft times humorous yet diverse physical rapport from Cornell himself. Cornell’s repertoire was representative of an interesting mix melding his B-boy beginnings with contemporary techniques in response to and in tandem with the other players including a martial arts practitioner and recent NAISDA indigenous contemporary dance graduate Kassidy Waters. Why does Matt Cornell’s dance deserve a spot in the NAIDOC themed blogs you might ask? Because like the Aboriginal and the B-boy community, the YouTube community is just that, a community (albeit a somewhat overcrowded one). Cornell is attempting to buck the trend which has evolved from single/star author choreographers in favour of focussing on the facilitation of the act of dancing, whereby every-body and no-one-body supremes simultaneously. A throwback to a time of folk dances (of sorts). Also, like the Dreaming, the YouTube virtual streamed community operates as a non-linear chronological portal imbued with the potential to revive and recreate material from anywhere and anytime represented within the YouTube database. This is an interesting proposition and I am intrigued to see how Cornell’s future manifestations pan out. "FORM is the only organisation in Sydney representing and supporting this range of activity, which is inclusive for many dance artists. The breadth and depth of FORM's activities contributes to vibrant dance ecology across both Western Sydney and Sydney City."